I just used Dengar in Training Droids challenge, and used Advantage from Phasma to confirm the debuff, and it does not work. Bobba is still resisting debuffs. Just a warning for all. While playing around with Dengar in GW, I used Bane's stun glove on a tencity down'd target, but the target still resisted the TM down effect. It was Slow, which I've landed on him before. Besides, immunities don't say resisted in my experience. I'm curious to see once he's starred up enough how it works in raids... Phasma guarantee crit with advantage and Dengar putting tenacity down on the rancor... Will he resist TM removal? You can never be sure something is working 100% correctly anyway. 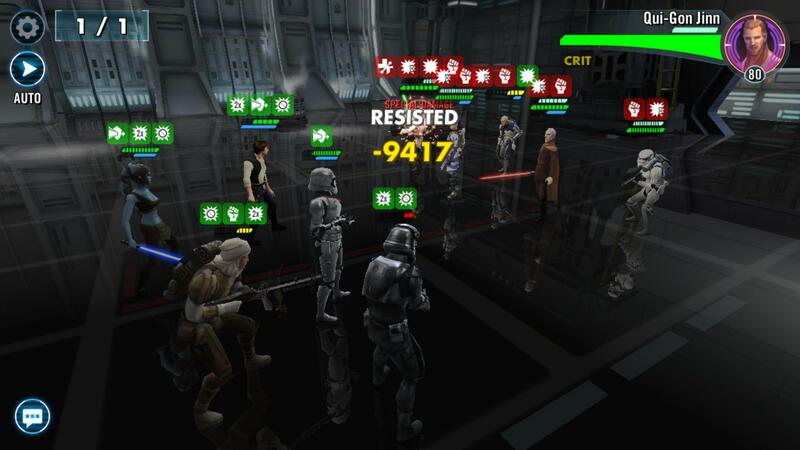 I am definitely seeing resists happening to different degrees on enemies with tenacity down. A few observations using a 5 star dengar lvl 80 77% potency. I have not seen Tenacity Down get resisted yet. Resist rates are definitely less frequent with Tenacity Down applied. Have been testing using low potency toons like Sid and FOTP. Currently it feels like it is a -%tenacity mechanic. Despite the debuff description. The screenshot below shows FOTP (0 potency) getting a resist. @EA_Jesse can we please get confirmation whether this is WAI or a bug? Thanks. @Josh_K Tenacity is what resists effects, not Potency. Also, That screenshot is showing QGJ resisting an effect, not FOTP. Maybe you got the wrong shot? D'oh, nevermind. I see what you're saying now. Have been playing around with it a bit. It seems pretty unpredictable. The most disappointing thing I've seen so far is a 24% tenacity ventress with tenacity down resisting a 62% potency Kylo. I can only conclude there is a chance to resist regardless of tenacity and potency. Like what happens with dodge.